Vancouver is known world wide for it's sustainable philosophy, it's care for nature and it's love of great food. The Fairmont Waterfront Hotel Vancouver embodies this way of thinking and puts it into practice with it's terrace herb garden and locally sourced ingredients for the dishes at the restaurant. Holding a wedding a venue like this lends with it a feel of nature and a love for luxury. With it's many banquet rooms like the Mackenzie room, It's Garden Wedding space, and it's top notch wedding coordinator Nicole Follno you are bound to have a fantastic day with all of your guests. Your opportunity for wonderful wedding photography is also available due to it's proximity to the boardwalk at Canada Place, the Stanley Park seawall and the access to all that downtown Vancouver has to offer. 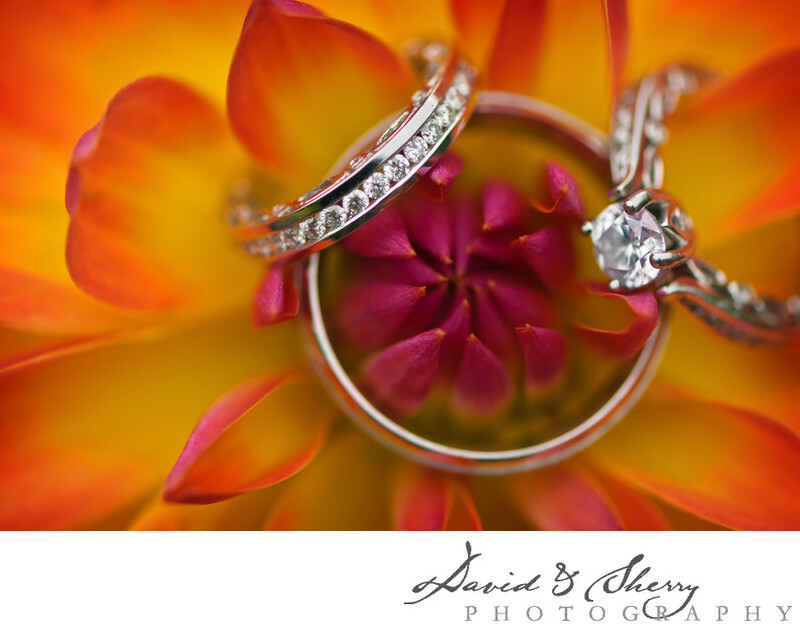 In this photo of the wedding rings David & Sherry have endeavoured to bring together nature and beauty by incorporating the decor as the background for the bride and the groom's wedding and engagement rings. The choice of colours in your wedding will add to your overall photos when you receive your album as it will give you a contrast between the black and white and vibrant pictures. The Fairmont Waterfront Hotel Vancouver is located in Vancouver, B.C. Location: 900 Canada Pl, Vancouver, BC V6C 3L5.